Gather your friends and family: the newest installment of the world’s most popular dance game is here! There’s no need for extra Wii Remotes; just get the free Just Dance Controller app and get dancing. Bust a move and get down with the hottest songs of the year, including new and classic tracks like “Let Me Love You,” by DJ Snake ft. Justin Bieber,* “Into You,” by Ariana Grande, “Cheap Thrills,” by Sia ft. Sean Paul, “Lean On,” by Major Lazer and DJ Snake ft. MO, “Can’t Feel My Face,” by The Weeknd, and many more! With two new game modes (a total of six modes), you can play with friends, connect with people around the world, and have fun working out. *Accessible only to Uplay account holders. High-speed Internet access and valid Uplay account required to access online features or unlock exclusive content. You must be at least 13 to create a Uplay account. 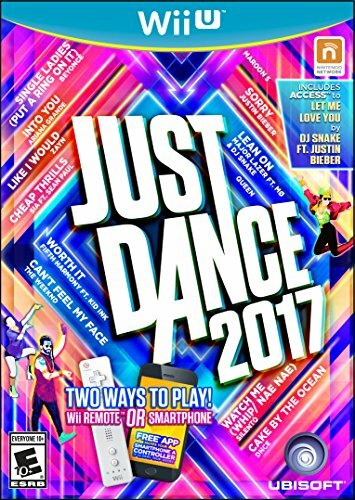 Ubisoft may cancel access to any specific online features upon 30-day prior notice on Just-Dance.ubisoft.com.Just Dance 2017 for Nintendo Wii U is the newest version of the world’s #1 dance game! Use your phone to control your movements. No extra Wii Remotes required! The free Just Dance Controller app scores your dance moves. Features the hottest hits of the year including “Let Me Love You,” by DJ Snake ft. Justin Bieber*, “Into You,” by Ariana Grande, “Cheap Thrills,” by Sia ft. Sean Paul, “Lean On,” by Major Lazer and DJ Snake ft. MO, “Can’t Feel My Face,” by The Weeknd, and more! Fun for all ages! Great for family gatherings, parties, and holidays.